Plate eighty-six from the third volume of James Forbes' "Oriental Memoirs". During his tenure as Collector of Bharuch, Forbes(1749-1819)spent many fuitful years in Western India. He spent 'many delightful days with large parties under' the 'Cubbeer Burr' named so in memory of the mystic-poet Kabir. It was a large banyan on the island in the river Narmada, home to many kinds of animals and birds. 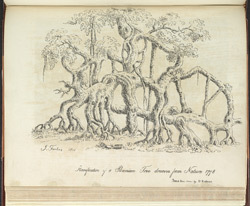 'During the many sultry hours passed under the shade of Cubbeer Burr, when the hot winds prevailed in the surrounding atmosphere, I amused myself by sketching the singular roots and extraordinary ramifications of this umbrageous canopy....from a number of these sketches I selected the present, to make a drawing in stone, by way of multiplying the original sketch for my friends'wrote Forbes with a remark on the usefulness of the lithographic technique.